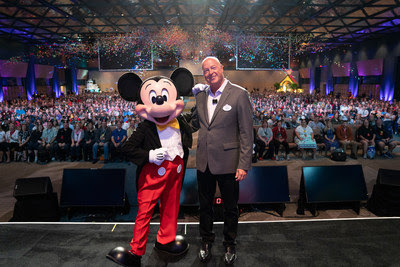 Today at D23's Destination D: Celebrating Mickey Mouse, Disney Parks, Experiences and Consumer Products Chairman Bob Chapek shared exciting new details surrounding highly-anticipated experiences coming soon to Disney parks. Destination D guests were the first to see Chapek reveal the names and the first-ever look inside the two signature attractions set for Star Wars: Galaxy's Edge when it opens at Disneyland Resort next summer and at Walt Disney World Resort in fall 2019. The audience was also the first to hear that Academy Award®-winning composer John Williams is creating original Star Wars themes exclusively for these lands, and was treated to a preview of this thrilling new music. Rounding out the galactic excitement, attendees heard more about the groundbreaking, fully-immersive Star Wars resort experience coming to Walt Disney World Resort. In celebration of 90 years of Mickey Mouse, Chapek shared the many new exciting ways to celebrate the beloved mouse. He also shared more about the multi-year transformation of Epcot, including new spectaculars designed to honor the park's original vision. "We are currently in the midst of one of the most extraordinary periods of expansion in our history," Chapek said. "We are always pushing the boundaries of what's possible as we deliver world-class experiences and attractions, new hotels and entertainment, itineraries and destinations for our guests." Attendees were excited to get the first in-person look at the Disney Skyliner gondolas that will transport guests to their favorite destinations when it debuts in fall 2019. The audience also celebrated Disney's #ShareYourEars campaign by participating in a group photo, led by Chapek and Mickey Mouse. Chapek announced yesterday that Disney will add a second phase to the #ShareYourEars campaign in honor of Mickey's 90th Anniversary. From Nov. 18-27, participants can take a photo showing off their "Mickey Mouse ears" – or any creative "ears" – and upload it to Facebook, Instagram or Twitter. For every public post with #ShareYourEars, Disney will donate US $5 to Make-A-Wish®, up to US $1 million, for a total of up to US $3 million. This is the third year in a row that Disney has run this campaign with Make-A-Wish to grant even more wishes. Since Star Wars: Galaxy's Edge was announced at D23 Expo 2015, fans have been eager to learn more. Today, Chapek announced that guests can take the controls in one of three unique and critical roles aboard Millennium Falcon: Smugglers Run. On Star Wars: Rise of the Resistance, guests can join an epic battle between the First Order and the Resistance – including a face-off with Kylo Ren. These two new incredible experiences, paired with the land's interactive components and optional integration with the Play Disney Parks app, will invite guests to become galactic travelers and live their own Star Wars stories in a galaxy far, far away. Chapek also announced that the music for Star Wars: Galaxy's Edge will feature original themes created especially for the land by Academy Award®-winning composer John Williams. Chapek shared a stirring preview of the all-new music, recorded by the London Symphony Orchestra at Abbey Road Studios. For 90 years, Mickey has entertained generations of families and fans. To celebrate the mouse that started it all, Chapek shared the many new ways guests will celebrate one of the world's most beloved icons. Imagineers have been hard at work creating Mickey & Minnie's Runaway Railway, using breakthrough technology to transform a two-dimensional cartoon into an amazing real-world experience. The first-ever ride-through attraction themed to Mickey Mouse – set to open in fall 2019 – will feature a new original story and lovable theme song as it takes guests on a journey inside the wacky and unpredictable world of Disney Channel's Emmy Award-winning "Mickey Mouse" cartoon shorts. Following the kickoff of World's Biggest Mouse Party earlier this year, the festivities continue at the Disneyland Resort with Get Your Ears On – A Mickey and Minnie Celebration, which will bring new entertainment, food and merchandise to the resort. On Jan. 18, "Mickey's Mix Magic" will light up the night at Disneyland Park with all-new music, projections and lasers that set the scene for an epic dance party that takes over almost the entire park. The party will get even bigger when the fan-favorite Mickey's Soundsational Parade returns to the resort in January 2019 featuring an all-new float with Mickey himself, who will lead the celebration down Main Street U.S.A.
Over at Walt Disney World, now there's more magic than ever. From Jan. 18 to Sept. 30, Mickey & Minnie's Surprise Celebration at Magic Kingdom will feature new food, merchandise and entertainment, including a new dance party with Mickey, Minnie and their friends, and a chance to meet Mickey and Minnie together in their new birthday outfits. On the high seas, Disney Cruise Line will welcome Mickey & Minnie Surprise Party at Sea, an all-new high-energy deck party on the Disney Fantasy next summer. Chapek also announced an all-new cinematic nighttime experience, Wonderful World of Animation, coming to Disney's Hollywood Studios on May 1 as part of the 30th Anniversary of Disney's Hollywood Studios. The show will use state-of-the-art technology to take guests on a magical journey through more than 90 years of Disney animation, all beginning with Mickey. Adding to the excitement, Chapek shared a look at the recently opened Mickey: The True Original Exhibition in New York City. The exhibition provides visitors with an interactive experience inspired by Mickey's impact on popular culture, from Instagram-worthy design elements to larger-than-life multimedia installations. The exhibition runs through Feb. 10, 2019, and tickets can be purchased at Disney.com/MickeyTrueOriginal. Fans were thrilled to hear more about the multi-year transformation of Epcot, designed to honor the park's original vision while making it more timeless, more relevant, more family and more Disney. At World Showcase, Chapek revealed that the Ratatouille experience coming to the France pavilion will be called Remy's Ratatouille Adventure. Guests will also enjoy a brand new "Beauty and the Beast" sing-along, created by Don Hahn, producer of the animated and live action "Beauty and the Beast" films. There will also be an update to the O Canada! 360-degree show. Chapek also offered a sneak peek at Disney's Riviera Resort, inspired by the European grandeur Walt Disney experienced in his travels along the Mediterranean coastline. Projected to open in fall 2019, this proposed resort will be the 15th Disney Vacation Club property.